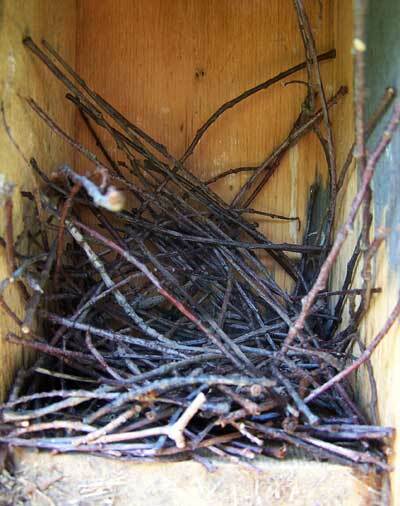 A typical House Wren dummy nest, found in a slot box. Notice the loose arrangement of sticks, it does not fill the box, no nest cup, and no spider cocoons. Dummy nests are placed in a variety of nestboxes by the male House Wren. The female chooses the box and them reconstructs a nest. See more information on House Wren Biology, and tips on Deterring House Wrens if you prefer not to let them use boxes on your trail.